My daughter Jubileena and I had a rough start to our time here at SAFE Haven; someone put us in boxes and abandoned us outside of the SAFE Care Clinic. Now, we all have to be grateful that they chose to do this and I'm not sure why they did it, but I hope that whatever circumstance they are in that they get better. Both of us are gorgeous grey kitties, practically Russian Blues, who really want a fresh start with a loving household. 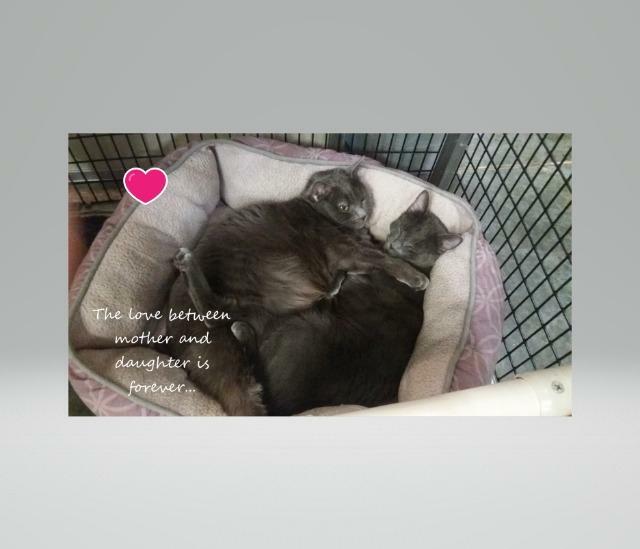 Do you have a heart for two beautiful and sweet kitty ladies in your life?